M3 Globular Cluster, LRGB taken with TEC140 @f7 and FLI ML8300 camera at -30. All binned 1x1, L 35x2min, RGB each 9x5m. Taken by Lynn Hilborn, April 6,8, 2011 at WhistleStop Observatory, Grafton, Ontario. A superb visual and photographic object, M3 contains about a half million stars and lies at a distance of 33,900 light years, further from us than the center of our galaxy. Photographically its diameter is about 200 light years but its tidal boundaries extend to about 760 light years. M3 possesses one of the densest core regions for a globular cluster having 50% of its total mass within the central 22 light years. M3 is one of the most studied clusters in the galaxy. It is particularly known for the unusual numbers of variable stars, especially the subtype RR Lyrae variables. These important stars are short period pulsating variables having a period from 0.2 to 2 days. Like Cepheid variables they are luminous and exhibit a close period-luminosity relationship making them useful as reliable distance indicators. Although not as massive or luminous as cepheids, they are useful for measuring distances to Milky Way clusters. M3 contains the largest number of RR Lyrae stars of any cluster with more than 180 identified. 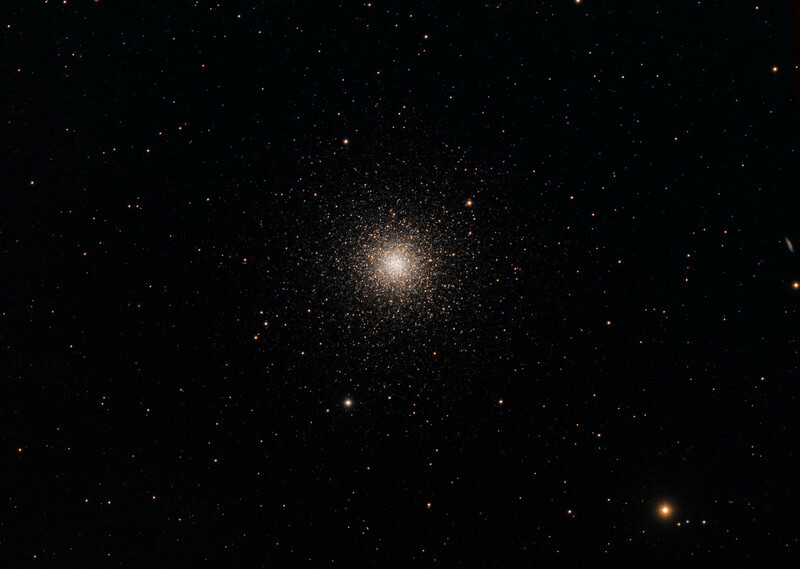 Although Globular clusters are made of ancient red population II stars, M3 has long been known to harbor an unusual number of bluer stars. Harlow Shapely noted blue stars in M3 as far back as 1915. If we assume that globular clusters are truly ancient star systems, how can we account for the presence of young blue stars within them? It seems many of the blue stars are old cluster stars that have depleted their core supply of hydrogen and are now fusing helium to carbon in their cores. These helium burning stars are known as horizontal branch stars as they have left the main sequence in their extreme old age. A subset of this group called blue horizontal branch stars comprise many of the blue stars we see in globular clusters. A more recent group of enigmatic blue stars found within globular clusters are the "Blue Stragglers" which were first described by Alan Sandage in 1953. These mysterious stars received their name because they appear to be "straggling" away from the normal evolutionary path of normal stars. They are twice as massive and one fifth the age as typical stars in the cluster. There are two explanations for their existence which may both be correct. Most stragglers are found in the densest regions of the cluster center which favors the theory that they formed from collisions of lower mass stars. The other theory proposes that mass transfer within binary systems may allow a star to accrete mass and become a blue straggler. This theory may explain the stragglers found in the outer regions of clusters where binary systems are more likely to survive. Text with permission of Robert Gendler.